Tiger Airways Holdings slipped back into the red for the quarter ending 30-Jun-2013 (1QFY2014) as its affiliates in Australia, Indonesia and the Philippines were again unprofitable. The group is confident its new partnership with Virgin Australia will soon lead to profits at Tigerair Australia and there will also be improvements at Tigerair Mandala and Tigerair Philippines, but challenges remain at all three LCCs. Meanwhile the group faces potential over-capacity in its home market as Tigerair Singapore accelerates expansion. The carrier is adding five aircraft over the next nine months for a total of 26 A320s, marking the biggest expansion in two years, when over-capacity led to losses. There are bigger potential opportunities for growth in Indonesia, but Tigerair Mandala has not yet become profitable. The outlook for Tigerair Philippines, which has been stuck at only five A320s for the last year, is bleaker. As a group, Tiger Airways Holdings incurred a SGD6 million (USD5 million) operating loss, which represents an improvement compared to the SGD12 million (USD9 million) operating loss in 1QFY2013. But the loss follows two consecutive quarters of profits for the three months ending 31-Mar-2013 and 31-Dec-2012, which ended a streak of seven consecutive quarters in the red that dated back to the beginning of 2011. Tigerair Australia reported an operating loss of SGD21 million (USD17 million), a slight improvement compared to the SGD17 million (USD13 million) operating loss from 1QFY2013. Tigerair Australia was 100% owned by Tiger until 8-Jul-2013, when the sale of a 60% stake to Virgin Australia was completed. Tiger Airways Holdings will start reporting in 2QFY2014 Tigerair Australia results as an affiliate, following the scheme it now uses for Tigerair Mandala and Tigerair Philippines. Tiger Airways Holdings recorded a SGD7 million (USD6 million) loss in 1QFY2014 related to its 33% stake of Tigerair Mandala and a SGD6 million (USD5 million) loss related to its 40% share of Tigerair Philippines. Tigerair Mandala incurred losses of SGD22 million (USD17 million) in 1QFY2014 while smaller Tigerair Philippines incurred losses of SGD15 million (USD12 million). Mandala began operating as a Tiger affiliate in Apr-2012. Tiger has since incurred SGD36 million (USD28 million) in losses related to its stake in the Indonesian carrier, which brings Mandala’s accumulated losses to SGD107 million (USD84 million). Tiger completed its 40% investment in SEAir in Aug-2012 although the Philippine carrier had been operating two Tiger A319s under a marketing tie-up with the group since the end of 2010. SEAir became Tigerair Philippines on 3-Jul-2013 as part of a broader rebranding which saw all four carriers in the portfolio taking on the new Tigerair brand. Since the equity deal was completed in 2QFY2013, Tiger has incurred SGD24 million (USD19 million) in losses related to its stake in Tigerair Philippines. Over the last year Tigerair Philippines has incurred total losses of SGD61 million (USD48 million). Tigerair Philippines has not expanded its fleet since Jul-2012, when it added three A320s which were sourced from the group to supplement the two A319s which were initially leased from Tiger in Dec-2010. Plans to take on more A320s from the group’s order book have been delayed multiple times over the last several months, an indication that Tigerair Philippines has been struggling to carve out a sustainable niche in the intensely competitive Philippine market. The group believes the badly needed consolidation which came to the Philippine market in early 2013 significantly improves Tigerair Philippines’ outlook. The consolidation resulted in the number of LCC players being reduced from five to three as AirAsia Philippines forged a tie-up with Zest, which now sees Zest operating under the AirAsia brand, while former LCC AirPhil Express adopted a full-service regional carrier model as it became PAL Express. But so far Tigerair Philippines has not benefitted from this consolidation as the carrier’s financial position and market share has failed to improve. Tigerair Philippines currently has only a 5.5% share of domestic capacity, matching the 5.5% share it had in Jan-2013, according to CAPA and Innovata data. The carrier has cut back domestic capacity slightly over the last two months and is making further domestic cuts over the next two months as it focuses more on the international market. Tigerair Philippines launched services on 18-Jul-2013 from Kalibo to Singapore, its fourth international route after Clark to Bangkok, Hong Kong and Singapore. It also has begun charter flights from Kalibo to Nanjing, Ningbo and Shanghai in China. Tigerair currently only accounts for just over 4% of total scheduled capacity in the Philippines (include flights operated by Tigerair Singapore to Cebu and Manila). 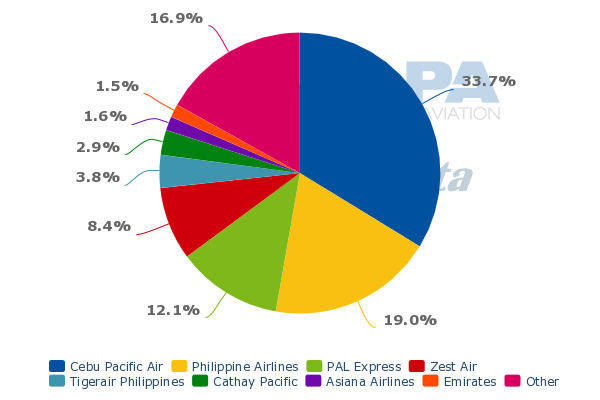 This compares to about a 34% share from market leader Cebu Pacific, about 31% from the Philippine Airlines Group (includes PAL mainline and PAL Express) and 10% from the AirAsia Group (includes Zest, AirAsia Philippines and AirAsia Malaysia). Tiger is in a precarious position as it will need to expand well beyond five aircraft to gain a meaningful presence in the Philippine market and enjoy economies of scale. But any expansion is risky given the stronger positions of Cebu Pacific, PAL and AirAsia. Expansion would also require a capital infusion from Tiger Airways Holdings and its Philippine partners. So far it seems the owners of Tigerair Philippines are reluctant to make the commitment. Tigerair Group CEO Koay Peng Yen during the 22-Jul-2013 media call to discuss the group’s 1QFY2013 earnings declined to say when Tigerair Philippines would again grow its fleet, saying the carrier has not yet announced its intentions for expansion. Tiger Airways Holdings for now is focusing more on expanding its other subsidiaries and affiliates. Of the three new A320s delivered to the group in 1QFY2013, Tigerair Mandala took two aircraft and Tigerair Singapore one aircraft. Mandala has taken a majority of the group’s new aircraft since the beginning of 2012 as all nine of the Indonesian carrier’s current fleet of A320s were sourced from the Tiger order book. Mr Koay would not say how many aircraft Tiger plans to allocate to Mandala for the remainder of FY2014. But Mandala has said it plans to further grow its fleet in 2H2013 and end 2013 with a fleet of 12 A320s. However, the carrier’s Indonesian owners prefer to expand by leasing second-hand A320s with the goal of eventually having 40% of its fleet consisting of six to eight year old aircraft (sourced directly from leasing companies) and 60% new aircraft (sourced from Tiger’s order book). Mandala aims to operate a fleet of 25 A320s by the end of 2015. While Mandala continues to be unprofitable its outlook appears brighter compared to Tigerair Philippines as it is actively expanding in a very large market which continues to grow. Tigerair Mandala still faces huge challenges in successfully carving out a niche in the competitive Indonesian market. But the carrier is building up economies of scale and a network that nicely leverages the Tigerair brand. For example, Tigerair Mandala is launching in Jul/Aug-2013 services from Jakarta to Hong Kong and Surabaya to Bangkok, two under-served routes to destinations that are already part of the Tigerair network (Tigerair Mandala already serves Bangkok from Singapore while Tigerair Singapore and Tigerair Philippines already serve Hong Kong). Tigerair Mandala also has been expanding in Singapore, where it now has seven flights to five destinations in Indonesia. This has been supplemented by rapid expansion to Indonesia by Tigerair Singapore, which has grown its Indonesian operation from only two daily flights at the beginning of 2013 to six flights in Aug-2013. There are huge opportunities in the short-haul international market for Mandala and the group overall given Tigerair’s already relatively strong position on international routes within and from Southeast Asia. Domestically the challenges are greater. Mandala has allocated about 50% of its capacity to the domestic market but the carrier has less than a 2% share of the Indonesian domestic market and does not serve any of its domestic routes with more than two daily frequencies. Overcoming competition against several larger carriers on domestic trunk routes will be challenging. In Indonesia’s international market Tigerair has quickly built up a 5% share (includes Tigerair Mandala and Tigerair Singapore capacity). Tigerair also now has a 10% share of capacity in the strictly international Singapore market (includes Tigerair Singapore, Tigerair Mandala and Tigerair Singapore capacity). Tigerair Singapore is preparing further expansion as it attempts to leverage its position as the second largest carrier and largest LCC in Singapore. The carrier says it expects to significantly grow its passenger traffic in FY2014 by increasing frequencies on “high demand” routes as well as by adding new destinations. Tigerair Singapore’s ASKs were up 24% in 1QFY2014 while RPKs were up 23%. Passenger traffic increased by 17% to 1.2 million although revenues increased by only 16% to SGD161 million (USD127 million). Similar or even higher growth figures are expected for the remainder of FY2014 as another five A320s are added for a total of 26 aircraft. Mr Koay is confident the Singapore market can absorb the additional capacity. But the last time Tigerair Singapore pursued such rapid expansion, in FY2012, the results were disappointing. The carrier incurred losses in the last three quarters of FY2012 and for the full year as ASKs were up 50% compared to FY2011, when Tigerair Singapore recorded a healthy 15% operating profit margin. Tigerair Singapore swung back into profitability in FY2013, albeit with a more modest 9% operating profit margin, as ASKs were up only 16%. Tigerair Singapore turned an operating profit of SGD6 million (USD5 million) in 1QFY2014, an improvement of 55% compared to 1QFY2013. But its operating profit margin was less than 4% and the carrier saw a discouraging 5% drop in yields. Tigerair blamed the drop in yields on the 89% increase in passenger service charges that came with its move to Singapore Changi Airport Terminal 2 from the Budget Terminal, which closed in Sep-2012, explaining it had to lower fares to offset the SGD16 (USD13) per passenger hike in fees. But the fact the carrier has been unable to pass on the higher charges could be a sign that supply is once again starting to outstrip demand in the highly competitive Singapore LCC sector. While Tigerair is now the largest LCC in Singapore, the market is already considered mature. Singapore now has LCC penetration rate of over 30% – very high for a market without any domestic services – and it does not have an emerging middle class population, which is driving rapid LCC growth in other ASEAN countries. Competition is also fierce with the AirAsia and Jetstar groups only slightly smaller than Tigerair, accounting for about 8% and 7% of capacity in Singapore respectively. Tigerair does have a new connection product, which was launched in Jan-2013 and offers passengers the opportunity to connect for a small fee at Changi between flights operated by Tigerair Singapore, Tigerair Mandala, Tigerair Philippines and Singapore Airlines long-haul low-cost subsidiary Scoot (SIA also owns a stake in Tigerair Airways Holdings). But connecting passengers will not be able to absorb the entire increase in capacity. Tigerair has not yet disclosed how many connecting passengers it is handling but Mr Koay said that the number of passengers connecting between Tigerair flights is several multitudes bigger than the number of passengers connecting to Scoot. With yields likely to remain under pressure in its home market as expansion is accelerated and with continued challenges at its affiliates, Tigerair could struggle to return to the black. The group is banking on a significant improvement in Australia under the new joint venture with Virgin Australia but even there a huge battle looms as competition with Jetstar intensifies. Tigerair Australia was once again in the red in 1QFY2014 despite an 85% increase in passenger traffic and a 9.9ppt improvement in load factor compared to 1QFY2013, when the carrier was still impacted by its mid-2011 grounding. Tigerair Australia has been consistently unprofitable since it was launched in 2007 and particularly since the grounding. Expectations of profits in recent quarters, or at least a break-even result, as the carrier restored capacity to pre-grounding levels have failed to materialise. Tiger Airways Holdings is now hoping Virgin Australia can succeed at breathing new life into the struggling carrier. Virgin Australia on 8-Jul-2013 took over a controlling stake in Tigerair Australia. Mr Koay says discussions about network changes have already begun between the two shareholders and enhancements are expected to be announced shortly. Tigerair Australia currently operates 11 A320s and the owners have committed to expanding the fleet to at least 23 aircraft and up to 35 aircraft by the end of FY2018. But neither shareholder has said how many aircraft could be added for the remainder of FY2014. With five of the group’s seven remaining deliveries for FY2014 already earmarked for Tigerair Singapore, growth at Tigerair Australia over the next nine months will likely be modest. Tigerair Australia could source aircraft outside the Tiger order book but this is unlikely in FY2014 as it will take time for the ownership team to fully implement a new business plan. The fact most of the upcoming deliveries are being funnelled into the mature Singapore market reflects the fact that Tigerair once again has limited options for its new aircraft, a scenario it found itself in FY2012 when the grounding in Australia and delays in starting new affiliates in Asia forced it to accelerate expansion in Singapore. The group now has affiliates in Indonesia and the Philippines up and running, but its Indonesian partner prefers to start sourcing aircraft outside the Tigerair order book while Tigerair Philippines continues to postpone fleet expansion plans. While Tigerair Singapore is the largest and only profitable carrier in the portfolio, the group needs stronger affiliates to grow and succeed. The group has not posted an annual profit since FY2011. Tigerair’s outlook, which was downright bleak one to two years ago, has improved following the Virgin Australia partnership and success at breaking into the hot Indonesian market. But the group faces the prospect of another annual loss in FY2014.